How do you rebuild after a natural disaster? This question was the call to action at the fifth edition of the MEXTRÓPOLI Festival of Architecture and City that took place March 17 to 20. The four-day city-wide event was presented as an active reflection to rebuild since last September’s major earthquake that struck central Mexico. Coincidently marking the 32nd anniversary of the 1985 Mexico City earthquake, the natural disaster in September last year hit hard on the same day three decades prior–at least 40 buildings collapsed, wreaking havoc in the Mexican states of Puebla, Morelos, and in the Greater Mexico City area. At MEXTRÓPOLI, temporary built environments activated Mexico City’s public spaces to promote reflection of those events and fuel sustainable future building. 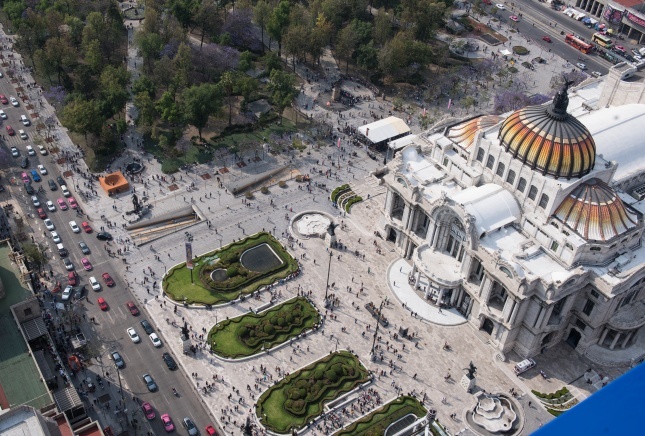 Twenty pavilions designed by institutions such as UNAM, Ibero Puebla, Anahuac University, Querétaro, Sci-Arc, and Maristas took up at Alameda Central, the oldest public park in the Americas located downtown, adjacent to the Palacio de Bellas Artes. The goal? To inspire sustainable and preventative practices, and to demonstrate potential sustainable architectural futures. 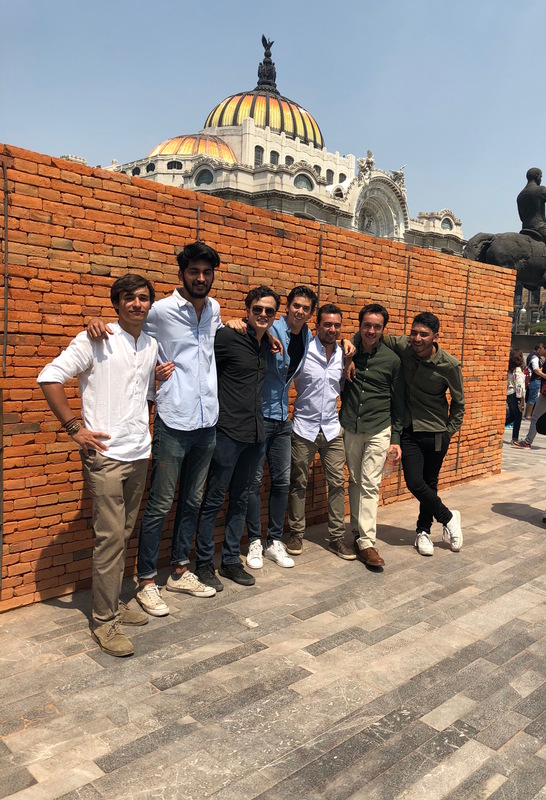 Architect Elias Kababie, Taller Paralelo Arquitectura, Michigan Architecture, and students from Colectivo Seis collaborated to design Pabellón ( ), a brick pavilion, with financial support from Masonite. The ephemeral structure is described by Kababie as a built testament to what local people felt in the aftermath of the quakes. “It creates an experience based on what we felt when everything was demolished,” explains Kababie. The structure itself was the very first built project for Colectivo Seis, who are only in their second year of college. As the story goes, on the first night of building the pavilion, the students and Kababie assembled the bricks made by a local factory and craftsman. The bricks themselves are made from locally-sourced clay, baked, and dried. Initially, they tried laying each brick one by one. Eventually, they made a rig that allowed them to stack eight bricks at a time. What took six hours to build on the first day took only one hour on the second. The trace of their handiwork lingers, with the red ochre-hued dust marking anyone who enters the pavilion. From the outside, the pavilion looks fortress-like, a cubic construction of six tiers of stacked brick on all four sides. Visitors were invited in by Kababie and the students through the periwinkle Masonite door into a narrow, tubular passageway. 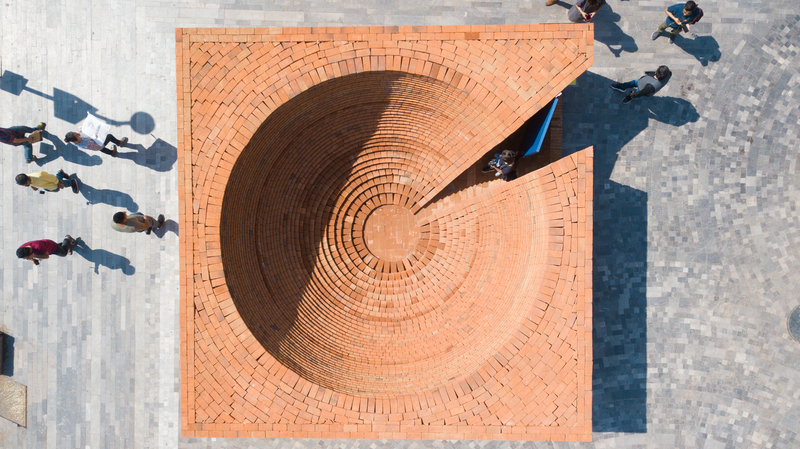 Once inside, onlookers are pleasantly surprised to find an undulating series of brick laid out to form the negative space of a circular sphere, or, if you will, an inverted oculus. The stacked formation encourages sitting and climbing, as well as spectacular views of the heart of Mexico City. Aptly dubbed, Pabellón ( ) is formally a parenthesis. 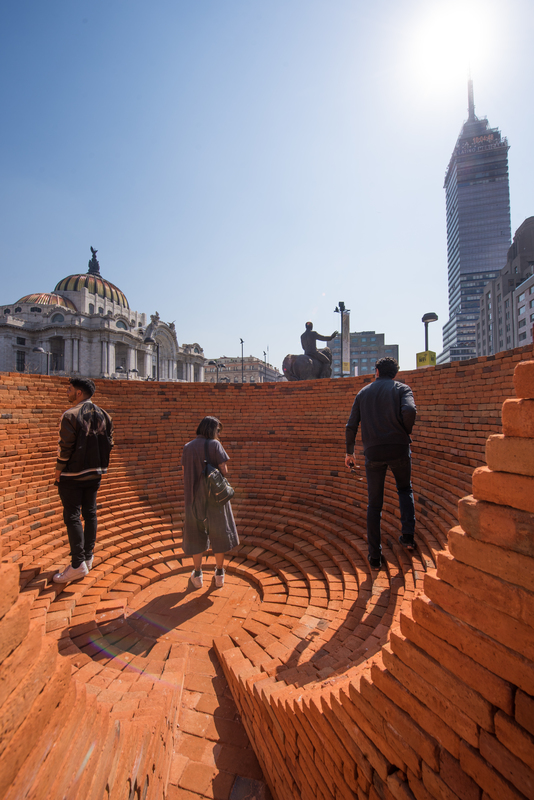 Conceptually, it is a theoretical interpretation of the meaning of “collapse,” what students from Colectivo Seis described as the continuum of material and emotional rubble that was left behind after the quake. These experiences are collectively housed between the empty parentheses, the material manifestation of the symbolic namesake, the pavilion. “It’s a metaphor for the current situation. When you have this perfect brick wall that when you walk outside, you don’t realize that there’s a greater structure, an emptiness that came about through the earthquakes. It’s still there and it hasn’t been fixed. We wanted this to be a point to talk about those aspects of our lives and that is still going on and many of us don’t realize it,” explained Alonso Varela of Collectivo Seis. You can find more videos of Mextropoli, Pabellón ( ), interviews, and other footage of the festival as a story highlight on AN’s Instagram story highlights.